Hubby hurried back to the car perplexed. I didn't hear Boogie's bark. I stepped down and heard hubby said my dog was dead. I went where my poor dog was and I saw him lying down lifeless. I cried. I can't believe he was gone. I remember I told him that I will have an extra time to play for him along with the other dogs, but he left me confused why it happened. Hubby checked his dead body if he has wounds that led to his death, but we didn't find one. Hubby's driver told us maybe someone poisoned our dog. Boogie was only three years old. I never thought he will leave us this early. We left him healthy and it is sad to know why some people manage to harm him that way. I miss him. I miss his barks. I miss the way we have our "high-five" session. I miss his bath session. I miss his smell. I miss everything. In fact, our neighbours miss him as well. We were advised that next time we will put nets at the back of our fence so if someone wants to throw food with poison so it will not go directly to our dogs. Moreover, we were warned also to be vigilant maybe someone is maliciously interested to enter our roof that is why it happened. Hubby buried Boogie somewhere in Sarangani. We visited him again the following morning before we headed to Davao that day. As I was fixing our things, I invited Boogie to come with us because he can now join us any time. I thought maybe he wants to go home in his hometown where he originally lives. 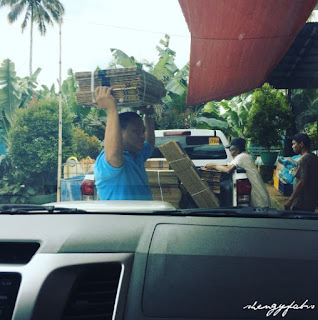 I don't know if you will believe me, but when we were heading to Davao, our mini-pinscher was barking aggressively at the back of our pick-up. It was unusual. I was still crying inside the car, then I saw a cloud-formed image like Boogie. I tapped my husband and he saw it as well. The dark sides of the cloud were like his head and his body because he was a black-masked Belgian Mallinois. The tail looks like Boogie's tail, too. It was like he was running in his wide playground. I felt the relief in my heart that time. I'm sure our Boogie1 is now happy in heaven. Even if our moments our short-lived Bogs, but you gave us memorable moments that we will always remember. I love you so much B1. Until we meet again. Happy New Year everyone. I hope everybody is well today. But, in spite of the challenges we are facing right now I know we are still blessed to be alive today, right? I have many goals to attain this year and I know you do as well. Obstacles will come our way, but with God nothing is impossible. For this year, I bought my 2017 devotional to guide me this year along with my Bible. I believe that God has all the answers to everything I face in this complex world of ours. I never thought hubby will be a victim of Dengue Fever so I will be sharing with you what was our experiences as husband and wife. Truly that in sickness and in health, we are there for each other. After hubby's work, he complained that he has a fever. His temperature reaches up to 39 degrees Celsius during the night so I gave him Biogesic every four hours to lower down his temp. I embraced him every time he had chills because it is my normal way of comforting him that he likes. At 6:00 in the morning, I woke him up. He still has a fever so I suggested going to the hospital to get his CBC because I am worried if he has a Dengue fever that time. I knew that Gensan has a Dengue outbreak so it would be better that hubby will undergo a laboratory test so both us will be relieved. That day, we brought his CBC test to our doctor and he already suspected maybe he has a Dengue even if he has a normal platelet count of 209. Normal rate of platelet count ranges from 150-400. The doctor advised us to get another CBC on the following day to monitor his platelet and if ever it will drop, I need to confine my husband right away. Hubby's platelet count dropped to 157 in the morning after he had his CBC test. We decided to check the admitting section if they can accommodate us, but unfortunately all rooms were full and we are in number 163 waiting list at St. Elizabeth Hospital. We went to General Santos Doctors Hospital and the same happened to us as well. Hubby's company nurse checked if other hospitals in the city can accommodate us and all of them are full also. Hubby was already exhausted so I told him we will eat Durian to brighten him up and maybe it will help him elevate his platelet. After eating, we went home. I still gave him his Biogesic every four hours because he had on and off fever that time. I consulted our family friend doctor and we were asked to have another CBC test on the following day and make sure that my hubby is hydrated. I bought Gatorade and additional Biogesic that night because hubby was not comfortable taking Tempra paracetamol. Instead of CBC test, hubby undergone Dengue test and the result was NS1 positive. It was that time that hubby accepted the fact that he has a Dengue Fever and not the normal fever he had during his lifetime. However, because of Dengue outbreak, it was impossible for him to be accommodated so I called my doctor's friend to help us secure hubby's room at San Pedro Hospital in Davao. We asked his staff to drive us to Davao City because hubby's health was already deteriorating. I do not know if it's psychological upon seeing the result, but I know in my heart that he was worried like me. He saw me crying when I was in the ER that morning where parents were crying over their helpless child because of Dengue. On our way to Davao, he already feels something bad happening inside his body. Skeletal pain was already there. We arrived at exactly 12:00 noon. Our family friend's doctor was already there to assist us so we were attended immediately. We went to our room after he had his X ray and gave them hubby's previous results for their reference. We were advised to continue drinking water with Oresol or OralRehydration Solution, Immucell capsules and Biogesic that will be given every four hours even he has his dextrose. At nighttime, he had his chills again. I was worried. I can't help, but cry. I hugged him tightly. His platelet count already dropped to 125. Platelet count dropped to 95 at 4:00 in the morning. He has on and off fever that day. We were advised to give him Biogesic if needed or if he has a fever. Moreover, we were informed that CBC test will be monitored every four hours because his platelet count was below 100. He started drinking tawa-tawa tea and juice of papaya leaves aside from water. If your loved ones are suffering, you will do the same thing like I did just to elevate hubby's platelet. I was advised by my friend who had Dengue experience as well to let hubby drink it. Hubby was restless. He was moving due to severe skeletal pain and headache. He was already irritable and asked me to caress his skin to ease the pain. Platelet count elevated to 122 at 2:00 in the afternoon. We were both happy. We were hoping that it will continue to rise. At 10:14 in the evening, his platelet count dropped to 64. He has fever and skeletal pains again. This was the time that he told God, “Thy will be done, Lord”. He slept after saying it and he dreamed about walking in the wilderness. He walked in a pathway under a bright moon as if it was like morning. He met different nationalities and understood them well. He was asked to stay, but he answered that he needs to go somewhere. He continued to walk heading to the bright light. He woke up when someone was calling his name that it was time to extract blood for another CBC. Platelet count dropped to 55. His doctor told us to make sure to drink more water and eat his food. Fortunately, my husband is an obedient patient so I have no problem about it. It was a critical day for him because his rashes were already visible. We were told that hubby's condition was unusual because he still has a fever and his platelet was already dropping. According to her, the usual condition is that fever should be gone and that is the time where the platelet will be starting to drop. She wanted hubby to fight so he will not experience bleeding that will lead to blood transfusion and other complications if it will drop to below 50. Before noon, hubby's platelet count elevated to 57. Of course, we are still conscious if his urine and stool has blood markings. Tawa-tawa tea and water with Oresol were still taken along with Immucell capsules and Cetrizine to mend the itchiness. On and off fever were still recorded. Temperatures, CBC, Sugar Test were still monitored religiously. At 6:00 pm platelet count result elevated to 69 and dropped to 66 at around 10:00 pm. At 6:00 in the morning, his platelet count elevated to 82. In spite of this increase count, hubby has to surpass Day 7. Continuous water intake along with Oresol, Immucell and Biogesic were asked of him to follow. His rashes were already gone. Platelet count at 11:00 am was 95. Platelet count at 7:24 pm elevated to 113. We were already happy, but we were warned that even the platelet count was increasing. His condition was not still stable. CBC tests were monitored every 8 hours because it was already above 100. 6:00 am CBC test result was 137. In spite of taking his hypertensive medicine every day that is Lozartan 50 mg, his blood pressure increases. His less sleep days were the culprit why he had it that time. Sad to say, he should be monitored every now and then. So, he was injected meds to calm him that day. At 3:00 pm his platelet count increases to 212. We were advised that we can go home that afternoon. I paid only 99.75 pesos of our hospital bill because of Ittelicare and Philhealth. Home medications were Lozartan to take every day morning and Zycast good for 10 days that will be taken before bedtime. Hubby was required to rest and drink lots of water and most especially he will visit his doctor again after one week. Whole- day rest. Since, hubby was complaining about shortness of breath. I borrowed my parents' lazy boy chair so he will be comfortable even during sitting while watching his favorite show on TV. Whole day rest again. His gouty arthritis arrived as expected because he failed to take his maintenance during his confinement. He was afraid that it will complicate his Dengue fever that time. We failed to inform his doctor about it. He was weak and helpless that day. He took Tramadol 50mg 3 x a day to ease the pain. At 4:00 am, we were alarmed that he experienced nosebleed. I called our family friend doctor right away of what to do and she advised me to let hubby lie down and press his nose hard to stop it. If it will continue, he will take Hemostan 500mg 3x a day. However, hubby was so lucky that day. It stopped and both of us were relieved. Of course, worries were still there because we were informed that once you have a Dengue, it will take more time for him to recover. It is a culprit disease. There are still patients died after confinement because they thought they are already okay. Even hubby has normal platelet count, he still has to drink water and eat well. At night, he felt dizzy. Lower blood pressure was recorded and I thought maybe his platelet drops. I called again the doctor and we were advised to take another CBC test and told us to stop his Lozartan. Platelet count elevated more than 645 that night. We were asked what he took that day and I told the doctor that he was drinking Kangen water for two days. In the meantime, she asked us to drink tap water again just to observe his hypertension. I guess hubby was not still okay so we have to be cautious of what he takes that time in accordance of what the doctor really told us to take. It was his first day not to take his Lozartan in the morning. His BP tests was still low. He decided to his morning meeting and jokingly told me that maybe his Monday meeting will try to give him higher BP. Unfortunately, when he arrived, he felt so dizzy and decided to go to his doctor right away for official advises. As usual, what our family friend doctor advised us were still his doctors' advised to him and that is to take a rest and continue to drink lots of water. Hubby loss 4 kilograms and maybe he was not comfortable that he is not hypertensive like before. I am very happy that I bought our BP monitoring to aid us with is happening to him right now. He was asked to have a complete rest. His doctor said that his condition was still the effect of Dengue to him. Because of this experience, I realized many things. Hubby is already paranoid about mosquitoes. He wishes that kids must be spared because he still remembers how Dengue breaks his bones during the process. It is not a joke. Honestly, when I saw hubby was crying that time, it taught me to be more vigilant so it will not happen again. Young and old, just beware.